Lemon Thyme looks like English Thyme and grows like English Thyme but that is where the similarity stops. Lemon Thyme definitely smells like lemon and tastes like lemon. It can be used in any recipe calling for lemon juice, lemon zest or lemon flavoring. It grows like a weed so there is always more lemon waiting in the garden. Lemon Thyme added to marinade is great with fish or chicken. 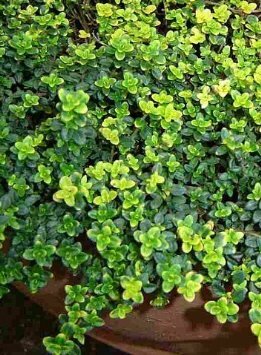 Lemon Thyme's glossy green foliage can be sheared to form one of the knots in a traditional knot garden. Culinary Thymes, like Lemon Thyme, are small which make them perfect candidates for growing in a container. Our 20 inch oval planters are perfect for keeping a fragrant pot of Thyme on the patio or windowsill.